Like other more famous châteaux, it had its origins in a hunting lodge, constructed for Louis VII about 1150 in the forest of Vincennes. 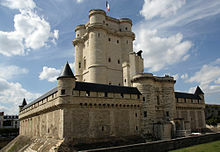 In the 13th century, Philip Augustus and Louis IX erected a more substantial manor: Louis IX is reputed to have departed from Vincennes on the crusade from which he did not return. 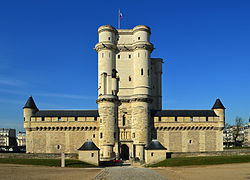 Vincennes was more than a grim fortress: Philippe III (in 1274) and Philippe IV (in 1284) were each married there and three 14th-century kings died at Vincennes: Louis X (1316), Philippe V (1322) and Charles IV (1328). To strengthen the site, the castle was greatly enlarged replacing the earlier site in the later 14th century. A donjon tower, 52 meters high, the tallest medieval fortified structure of Europe, was added by Philip VI of France, a work that was started about 1337. The grand rectangular circuit of walls, was completed by the Valois about two generations later (ca. 1410). The donjon served as a residence for the royal family, and its buildings are known to have once held the library and personal study of Charles V. Henry V of England died in the donjon in 1422 following the siege of Meaux. The relics of the Crown of Thorns were temporarily housed there while the Sainte-Chapelle in Paris was being readied to receive them. A fragment that remained behind received its own chapel at Vincennes, probably built by Peter of Montereau (who may have designed the Sainte-Chapelle in Paris), which survives (illustration, below). Henri IV was imprisoned at Vincennes in April 1574, during the Wars of Religion, and Charles IX died here the following month. In the 17th century, the architect Louis Le Vau built for Louis XIV a pair of isolated ranges mirroring one another across a parterre to one side of the keep, suited for the Queen Mother and Cardinal Mazarin, but rebuilding was never pursued once Versailles occupied all attentions. Some splendid apartments show the earliest phase of Louis XIV style, before the example of Vaux-le-Vicomte presented the Sun King with a worthy model. The unlucky builder of Vaux-le-Vicomte, the minister Nicolas Fouquet, found himself transferred to Vincennes, to much less comfortable lodgings. In 1691, another unwilling lodger was John Vanbrugh, soon to become a playwright and architect, who drew some of his Baroque "gothick" from his experience of Vincennes, it has been argued. Abandoned in the 18th century, the château still served, first as the site of the Vincennes porcelain manufactory, the precursor to Sèvres, then as a state prison, which housed the marquis de Sade, Diderot, Mirabeau, and the famous confidence man, Jean Henri Latude, as well as a community of nuns of the English Benedictine Congregation from Cambrai. At the end of February 1791, a mob of more than a thousand workers from the Faubourg Saint-Antoine, encouraged by members of the Cordeliers Club and led by Antoine Joseph Santerre, marched out to the château, which, rumour had it, was being readied on the part of the Crown for political prisoners, and with crowbars and pickaxes set about demolishing it, as the Bastille had recently been demolished. The work was interrupted by the marquis de Lafayette who took several ringleaders prisoners, to the jeers of the Parisian workers. It played no part during the remainder of the Revolution. From 1796, it served as an arsenal. The execution of the duc d'Enghien took place in the moat of the château on 21 March 1804. General Daumesnil who lost a leg, which was replaced by a wooden prosthesis, at the battle of Wagram (5–6 July 1809), was assigned to the defence of the château de Vincennes in 1812. Vincennes was then an arsenal containing 52 000 new rifles, more than 100 field guns and many tons of powder, bullets, canonballs... A tempting prize for the Sixth Coalition marching on Paris in 1814 in the aftermath of the Battle of the Nations. However, Daumesnil faced down the allies and replied with the famous words "I shall surrender Vincennes when I get my leg back" (Je rendrai Vincennes quand on me rendra ma jambe, with a polysemic pun in French that is lost in translation). With only 300 men under his command, he resisted to the Coalition until king Louis XVIII ordered to leave the fortress. The park was recreated in the English landscape style in the 19th century. 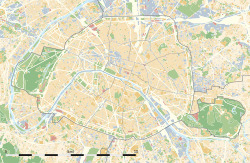 In 1860, Napoleon III, having employed Viollet-le-Duc to restore the keep and the chapel, gave the Bois de Vincennes (9.95 km² in extent) to Paris as a public park. Vincennes also served as the military headquarters of the Chief of General Staff, General Maurice Gamelin during the unsuccessful defence of France against the invading German army in 1940. It is now the main base of France's Defence Historical Service, which maintains a museum in the donjon. On 20 August 1944, during the battle for the liberation of Paris, 26 policemen and members of the Resistance arrested by soldiers of the Waffen-SS were executed in the eastern moat of the fortress, and their bodies thrown in a common grave. Only traces remain of the earlier castle and the substantial remains date from the 14th century. The castle forms a rectangle whose perimeter is more than a kilometer in length (330 x 175m). It has six towers and three gates, each originally 13 meters high, and is surrounded by a deep stone lined moat. The keep, 52m high, and its enceinte occupy the western side of the fortress and are separated from the rest of the castle by the moat. The keep is one of the first known examples of rebar usage. The towers of the grande enceinte now stand only to the height of the walls, having been demolished in the 1800s, save the Tour du Village on the north side of the enclosure. The south end consists of two wings facing each other, the Pavillon du Roi and the Pavillon de la Reine, built by Louis Le Vau. Fort Neuf de Vincennes, built to the east of the fortress beginning in 1840 to provide an up-to-date artillery platform as part of the Thiers Wall defenses of Paris, now a military headquarters. ^ Christopher Hibbert, The Days of the French Revolution 1980:133f. ^ "Le donjon de Vincennes livre son histoire". Frank McCormick, "John Vanbrugh's Architecture: Some Sources of His Style" The Journal of the Society of Architectural Historians 46.2 (June 1987) pp. 135–144. Northern wall and main entrance to the castle. Wikimedia Commons has media related to Château de Vincennes. French web site about history of Castle of Vincennes, with many illustrations.